Buy 6 bottles for £57.50 each. Save £30.00 !! The production secrets and the vinification method of this cuvee go back to the origins of the House of Billecart-Salmon and have been handed down for seven generations. 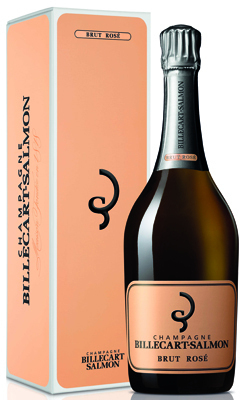 Billecart-Salmon Brut Rose is a blend of Chardonnay, Pinot Meunier and Pinot Noir vinified as red wine. Its pale and bright pink colour is adorned with warm glints of gold and its delicate slowly rising bubbles give it a persistent mousse. This cuvee unveils a subtle aroma leading to an elegant, delicate bouquet of fine notes of red fruits and zest of citrus fruits. Its special method of vinification gives this cuvee a light, elegant flavour, followed by a fresh finish with a taste of raspberry. A composed and fine aromatic palate; very moreish. An exemplary definition of wine; full bodied and with depth. This regal champagne would be revered in any House. The price of success? A price for a special cuvee. Billecart-Salmon, a medium-size Champagne House in Mareuil-sur-Ay, was founded in 1818 by the original owners Nicolas Francois Billecart and Elisabeth Salmon who combined their names on marriage to create the brand. It is one of the few remaining Champagne houses to remain family owned. Billecart-Salmon is renowned for the quality of its delicate Rose, whilst the Brut Reserve (a blend of three vintages) is a beautifully harmonious and balanced wine. All have the ability to age very well. The Cuvee Nicolas-Francois Billecart 1959 won the title in the Champagne of the Millennium 1999, out of 150 of the finest 20th Century champagnes. A magnum of the winning champagne later sold for £3,300.